Veeam Management Pack v8 for System Center beta is here! With Veeam Management Pack (MP) v7 R2, Veeam delivered a very solid management pack for monitoring Microsoft Hyper-V, VMware vSphere and Veeam Backup & Replication. IT never stands still, however, and nor does Veeam! Today, I am pleased to tell you that Veeam Management Pack v8 beta is available. As always, some very exciting new items are included in this release. This release builds on Veeam MP’s core value of delivering complete visibility of your datacenter. And based on both your feedback and our research, we’ve added many new, high-value features to provide you with actionable data to drive better, more informed business-IT decisions. Let’s look deeper into five exciting new features and improvements that you’ll find in Veeam MP v8. 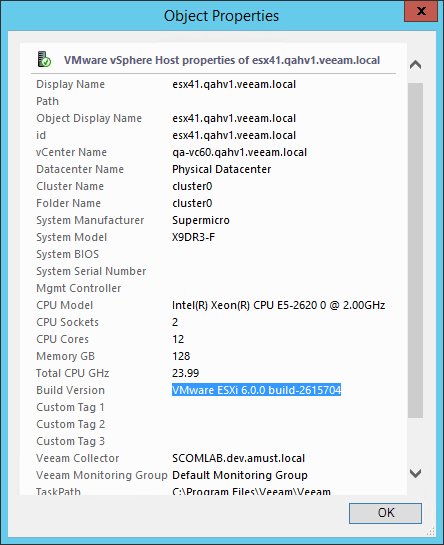 Veeam MP v8 now supports VMware vSphere 6.0. This is in line with Veeam’s release of Update 2 for Veeam Backup & Replication and Veeam ONE™, which also includes vSphere 6.0 support. For those upgrading or deploying vSphere 6.0 and managing it with System Center Operations Manager, you now have full visibility into that environment, including Virtual Volumes (VVols) datastores and other vSphere 6.0 features. This is the new feature that I probably like the most. As a former system administrator, one of my daily-recurring morning tasks was to check the entire environment and ensure that everything was in good shape. Accomplishing this task often required a large cup of coffee. Now, Veeam MP’s new Infrastructure Summary report does the work for you by providing a single overview report to check the status of the entire environment. 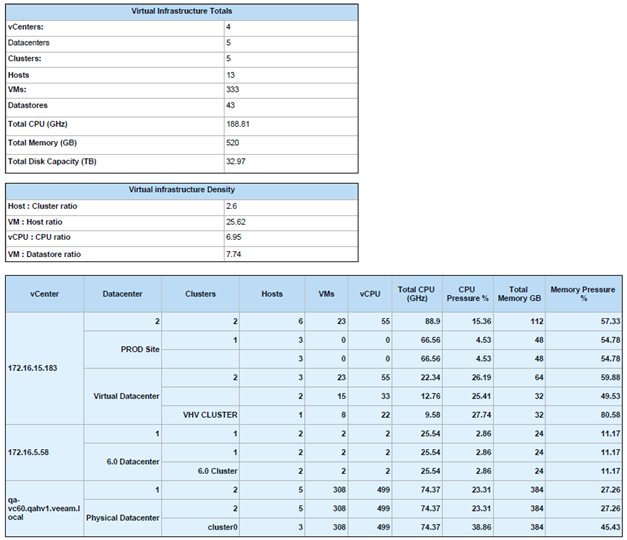 In this report, which you can schedule to run on a daily basis, you can quickly see your entire infrastructure and important values such as density for hosts, clusters, vCPU and more. You can also see the CPU pressure and memory pressure per host, cluster or datacenter. Finally, you can see the pressure on your over-provisioned datastores. 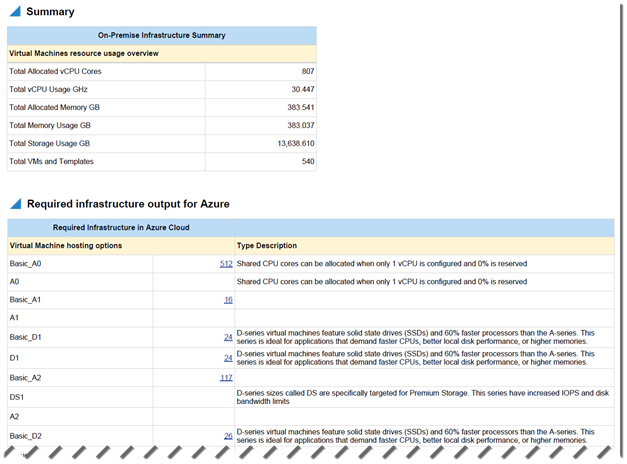 We introduced the Hybrid Cloud Capacity Planning report in our previous Veeam MP version, which allowed you to project the cloud resources you would need to move workloads to the Microsoft and VMware public clouds. Now, we’ve updated these analytics in Veeam MP v8 with the latest options for both Microsoft and VMware. We’ve also added more logic into the report to increase prediction accuracy. Every virtualization admin knows about snapshot problems. Whether it is a Microsoft Hyper-V checkpoint or a VMware vSphere snapshot, the problem is the same: snapshots and checkpoints that stay open too long can increase in size and quickly become performance problems for your storage. With our detailed checkpoint and snapshot tracking, you can now quickly identify storage-related performance issues across your entire virtual environment. In MP v8, we’ve introduced an updated dashboard using the custom Veeam heatmap widget that we call Snapshot Finder . 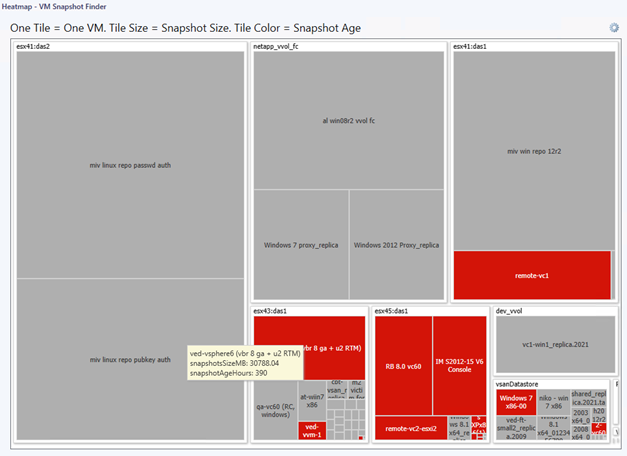 Once you use this Veeam MP dashboard to quickly locate snapshots, a detailed, new report lists the entire snapshot tree, plus a timestamp and comments. This allows you to identify the snapshot’s owner and justification so you can either quickly remove it or take another appropriate action. 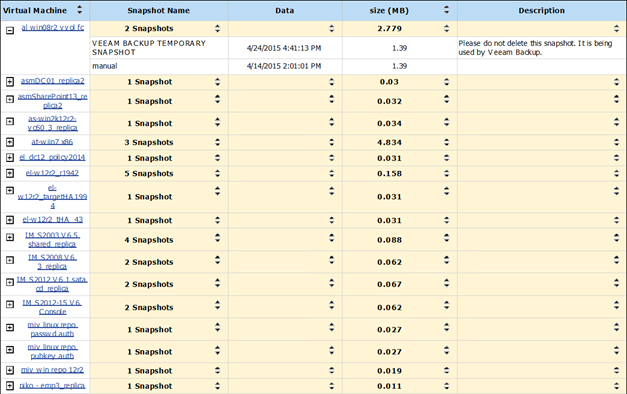 If you are using SMB 3.0 file shares for your Hyper-V VMs, Veeam MP adds visibility there too. 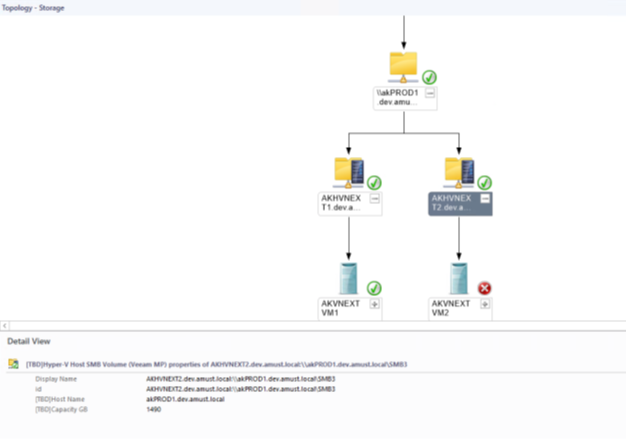 SMB shares can now be seen in the Storage Topology view, with drill-down to the virtual machine (VM) level. 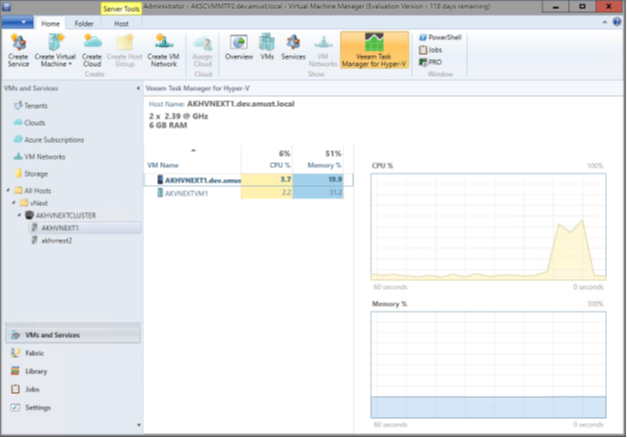 Veeam MP also monitors performance and availability of SMB storage. Of course! Besides the above five added features and improvements, we also added some interesting things to help you make faster and better-informed IT decision-making. We’ve added additional tuning and optimization to correct over-sized and under-sized VMs and hosts. This means you can now decide on peak or average resource usage for right-sizing advice. You can also leverage data collected from inside a virtualized OS with the System Center Operations Manager agent, so estimates are more application-aware. Our famous Veeam Task Manager for Hyper-V now comes as a plugin for Microsoft System Center Virtual Machine Manager (VMM). This allows you to see real time performance metrics on your hosts and VMs, embedded in the VMM console. In addition, we have enhanced our vCenter alarm monitoring to track system configuration health, security certificates, hardware components and more. And last, but not least, there are some new, cool dashboards, widgets, reports and visualizations available. The new Veeam Management Pack v8 for System Center will support the latest hypervisor versions and Veeam Backup & Replication versions. In addition, it provides additional support for VMware vSphere v6 and it comes with more functionality, logic and actionable data for management, planning, forecasting and making good IT business decisions. If you are already using Veeam Management Pack for System Center, then please put our Veeam MP v8 beta to the test in your lab and give us feedback! If you are not a customer yet, but are looking for a management pack that delivers complete visibility and brings relevant, timely data with alert management, dashboards, reporting, on-premises and hybrid-cloud capacity planning—then this is a must-try-to-believe-it product! For all feedback, questions and possible issues with Veeam MP, visit our dedicated MP forum (http://forums.veeam.com/veeam-management-pack-for-microsoft-system-center-f1/).